The last couple days I haven't been bringing my camera wherever I go. Wouldn't you know it, I've encountered some really "classic" incidents. As a result I decided to do some "memory sketches". 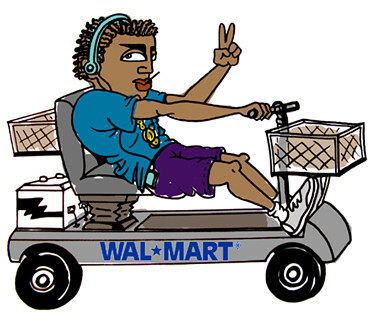 The first incident: While searching Wal-Mart for the elusive 4th season DVD set of Northern Exposure, I noticed a very relaxed urban youth chillin' with some tunes while cruisin' the aisles. 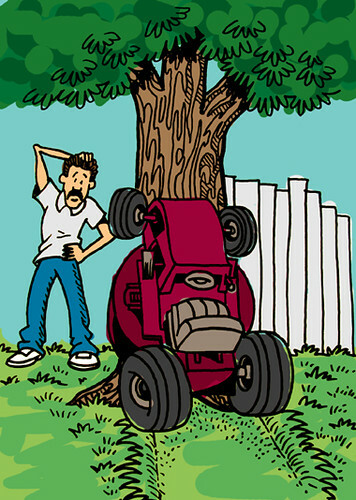 The second incident: A guy's son drove the riding mower partially up a tree. Apparently the kid was ok because the entire family was laughing, taking photos and videotaping the after affects of the incident. Needless to say it's time to start bringing the camera again. Love it! Better than a photo cuz!